India's 'Iron Lady Of Manipur' Ends Hunger Strike After Nearly 16 Years, Plans To Run For Office : The Two-Way Irom Sharmila stopped eating in 2000 to protest a law that gives broad powers to security forces in her home state of Manipur. She was arrested and has been force-fed ever since. 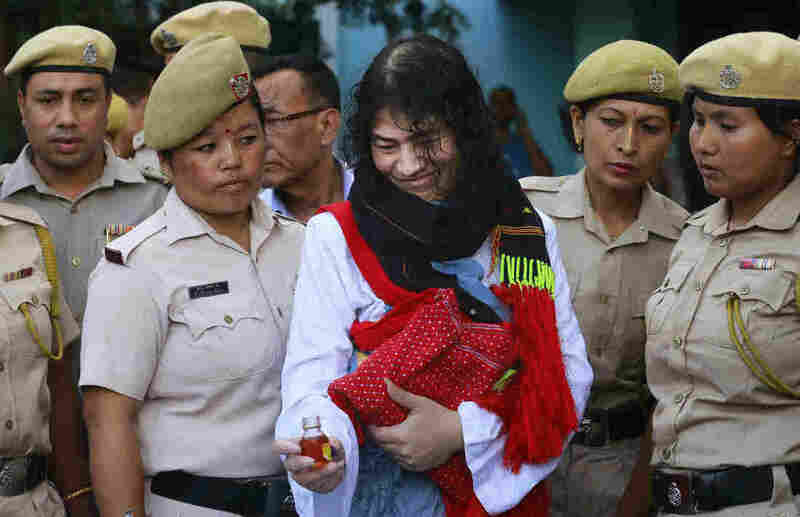 Indian political activist Irom Sharmila is taken back to a hospital after a court appearance in the state of Manipur on Tuesday, a few hours before she ended her fast. Irom Sharmila ate on Tuesday for the first time in nearly 16 years. 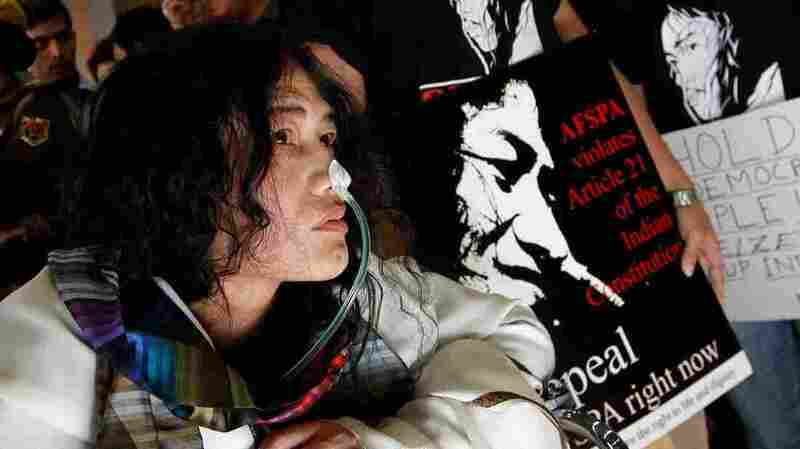 The Indian activist started a hunger strike in November 2000, to protest a law that gives broad powers to security forces in her home state of Manipur. She was arrested by authorities, forcibly hospitalized and force-fed through a tube in her nose. "The Iron Lady of Manipur" continued to be force-fed until Tuesday afternoon, when a judge granted her release and — tube removed — she licked honey from her hand. "I have to change my strategy," Sharmila said, according to the BBC. "I have been fasting for 16 years and I have not got anything from it yet." Known as the "Iron Lady of Manipur," Sharmila arrives in New Delhi in March 2013, more than 12 years into her hunger strike. She was called into a Delhi court after being accused of attempting suicide. Now she plans to run for office in Manipur and push for the repeal of the Armed Forces Special Powers Act. "The law gives security forces the right to shoot to kill suspected rebels without fear of possible prosecution and to arrest suspected militants without warrants. It also gives police wide-ranging powers of search and seizure. "The act prohibits soldiers from being prosecuted for alleged rights violations except with express permission from the federal government. Such prosecutions are rare. "Manipur, like some other parts of the northeast, faces unrest from separatist militant groups fighting for ethnic enclaves or independent states. Most northeasterners are ethnically more tied to China or Myanmar than they are to most of India." Amnesty International and Human Rights Watch have both called the law "draconian" and say it violates international law. "International bodies including the United Nations have argued for a repeal of the law on human-rights grounds," The Wall Street Journal reports. "A three-member panel appointed by India's Supreme Court said in a 2013 report that security forces acting under the law were committing human-rights violations." But, as the Two-Way reported in 2013, "the military says the law is needed to combat insurgents, and the government has refused to weaken it." Last month, India's Supreme Court ordered an investigation into the use of force in Manipur. 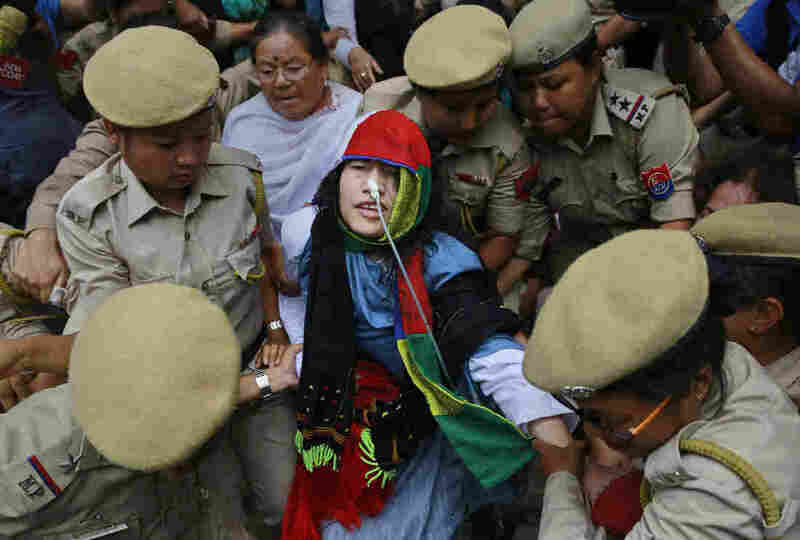 Sharmila's protest began after 10 civilians were killed by soldiers in Manipur, the AP reports. She was repeatedly arrested and charged with attempted suicide, which allowed authorities to keep her in custody and force-feed her. Sharmila always fought the charges, saying her refusal to eat was not suicidal and that she was doing nothing illegal. She was released on Tuesday after posting bail and promising to eat again. Sharmila picks up a bottle of honey as she prepares to break her fast Tuesday in Imphal, India. Sharmila's decision to end her fast surprised many people close to her, The Los Angeles Times reported last week. Some of her supporters have wondered if Sharmila's relationship with her fiance — whom she first met via letters — influenced her decision. Others see her decision as a considered shift in strategy, after 16 years without change. "Sharmila, who passes her time writing poetry, reading literature and taking walks with visitors in the hospital compound, has said over the years that she does not seek personal glory," the Times reports. " 'I don't want to be a goddess,' she once told the Indian Express newspaper. 'I just want a normal life.' "